This paper demonstrates that traders gain nothing by positioning their computer at the midpoint between two financial exchanges — for example on a ship in the middle of an ocean — contrary to the recommendation in the article Physics in finance: Trading at the speed of light (Mark Buchanan, Nature, 11 February 2015). We show that, in fact, a trading strategy using cooperating computers colocated with the two exchanges will perform much better than a single computer located at the midpoint. This advantage of distributed trading strategies is non-obvious and — to my knowledge — has never been explained as simply and convincingly as in this paper. In the final section I examine the reverse issue: using distributed exchange server architectures that eliminate the need for distributed arbitrage strategies. In future, when airborne laser networks span the oceans, things may get even stranger. The location at which traders get the earliest possible information from two exchanges lies at their mid-point — between Chicago and London, this is in the middle of the Atlantic Ocean. At such a site, traders could exploit a technique called ‘relativistic arbitrage’ to profit from momentary imbalances in prices in Chicago and London. To explain: special relativity says that nothing can travel faster than the speed of light, c. Hence, a trader standing a distance D away from an exchange can find out what happened there, in the best circumstance, at a time T = D/c after it happened. Between major trading centres around the globe, such delays can be from a few to tens of milliseconds. If a trader stands halfway between the two exchanges, he or she will receive information from both after the same interval, T = D/c. Anywhere else, the distance to at least one of the exchanges would be greater and information would take longer to get there. In other words, within a few years it may become profitable to station a ship or other trading platform near halfway points between pairs of financial centres worldwide (see Fast-trading hotspots). 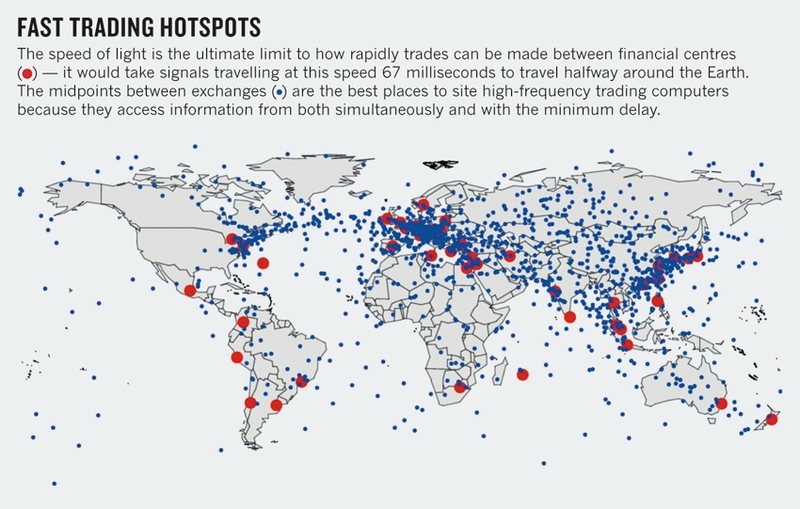 The Nature article provides a map of the world showing all world financial centers and over a thousand midpoint locations where high-frequency traders would need to position their computers to optimally exploit the possible arbitrage possibilities. As expected, many of these “optimal” locations are truly in the “middle of nowhere” (one lies in the desolate spot where the flight MH 370 has disappeared). The map does not indicate the importance of the centers or the significance of the “fast trading hotspots”, but it is clear that the most significant hotspots lie someplace in the North Atlantic Ocean. The map of Fast Trading Hotspots . Used with permission of Nature Publishing Group. The map originally appeared in the paper Relativistic statistical arbitrage. The “midpoints” in that article are weighted by turnover velocity (ratio of the value of shares traded on the exchange to the total market capitalization) — they are not true geodesic midpoints, as implied in the Nature article. Furthermore, the “financial centers” defined in the article turn out to be the 52 member stock exchanges listed in the World Federation of Exchanges 2009 Annual Report — they do not include Forex exchanges which dwarf all other trading venues by an order of magnitude in terms of trading volumes. The Nature article is trivially correct in stating that the midpoint between the two exchanges is the point where an arbitrage opportunity can be first discovered. What is less obvious — given that Mark Buchanan, a respected physicist and author got it wrong — is that the midpoint location is a particularly bad place where to make trading decisions. So, HFTs know that trading from a midpoint location between exchanges is a bad idea. However, Harts’ statement is not entirely correct — the midpoint trader is in fact as fast as anyone could be to take advantage of a price disparity between the two exchanges. Where she loses compared to “traders stationed at the actual markets” is that — after submitting her orders, she is blind and out of control of her orders. Read on to see the truly incredible advantage of server colocation and distributed trading strategies. For the sake of generality we will refer from now on to “servers” rather than “exchange servers”, because our result applies to scenarios much more general than a trading algorithm communicating with financial exchanges. We will use the word “computer” to refer to a non-server computer running a program that communicates with the servers (for example, a trading strategy algorithm). Theorem 1. Any algorithm that runs on a single central computer located anywhere in the world and is connected to N ≥ 1 servers can be re-implemented using a group of N computers that are colocated with the respective servers in such a way that the new implementation’s behavior (as observed by the servers) is indistinguishable from the original single computer solution. The proof is quite straightforward. First, we formally define the single central computer mechanism. We then show how to construct an equivalent mechanism that uses a group of computers colocated with the respective exchange servers, with no need for the central computer. In other words, we start with a black box implemented using a central computer and show how to construct an equivalent black box without a central computer. Finally, we will point out the obvious superiority of the distributed solution. First, let us define formally the basic “central computer mechanism”. Note that it is much more general than the midpoint computer scenario considered in the Buchanan’s article. Consider N servers X1, …, XN and a central computer C located anywhere in the world and running an algorithm A (for example, a trading strategy). C is connected to all of the servers — it receives inputs from and sends outputs to each of them. We think of this mechanism as a black box where the inputs and outputs can be observed and timed by observers located at the N servers. See the Central computer mechanism figure. Let di denote the transmission latency between C and the server Xi. Let di,j denote the latency between Xi and Xj. These latencies are assumed to be constant and not to vary from message to message. We assume that the network latency satisfies the properties of a metric, in particular: di,j = dj,i (symmetry) and di,j ≤ di + dj (triangle inequality). The output of the algorithm A consists of messages sent to the servers. All messages are time stamped using the local clock used by A and may contain any information, including internal status reports referring to the current state or to past events. Here, we present a mechanism that will duplicate the behavior of the central computer mechanism using N computers C1, …, CN colocated respectively with the servers X1, …, XN. Just as in the previous case, we think of this mechanism as a black box where the inputs and outputs can be observed and timed by observers located at the N servers. See the Colocated group mechanism figure. 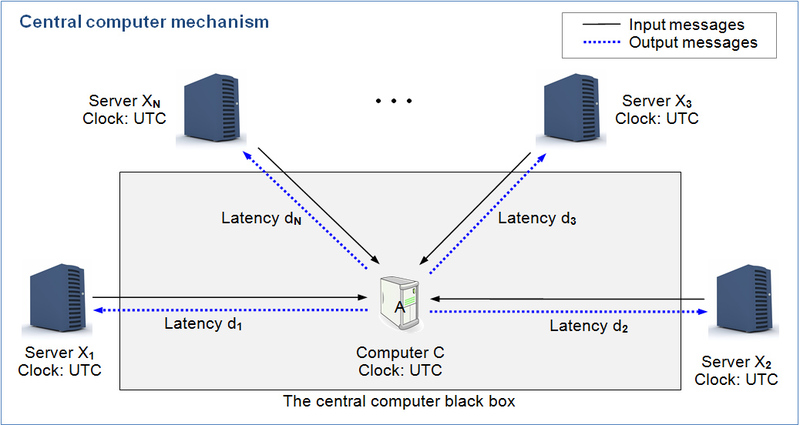 For the sake of simplicity, the transmission latency between the computer Ci and the colocated server Xi is taken to be zero. The transmission latency between Ci and Xj is taken to be di,j — the same as the latency between Xi and Xj. Each algorithm Aj receives messages from all N servers. Specifically, the messages from a server Xi that would be sent to the original central algorithm A are replicated and sent to all algorithms Aj. Message replication may be accomplished either in hardware or in software running on the computer Ci colocated with Xi. An artificial delay di + dj – di,j is introduced for all messages received by Aj from the server Xi. Message delays may be implemented either in hardware or in software running on Cj. (It is convenient to think of the delay generators as a modification of the algorithm Aj.) Note that when i = j, the delay is di + di – di,i = 2⋅di. That is, the delay for all messages sent by the server Xi to the collocated computer Ci is 2⋅di. The algorithm Ai sends its output messages only to the colocated Xi server. When the original algorithm A would send a message to another server Xj, Ai does nothing — instead, the algorithm Aj colocated with Xj sends the identical message at precisely the right time. Ai may log this event, however, just as A would do so. 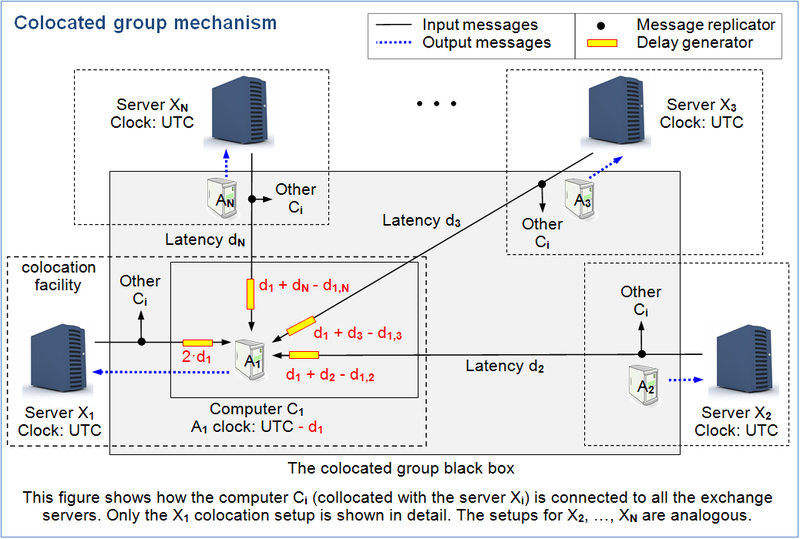 To verify that the colocated group mechanism works the same as the central mechanism, one needs to verify that given inputs result in the same outputs, received at the same time by the servers, for both black box mechanisms. It is easy to see that, for any j, the algorithm Aj receives exactly the same message inputs as would be received by the algorithm A, but Aj receives them after a delay dj with respect to the clock used by A. Specifically, at time t, A would receive a message from server Xi that was sent at time t – di. That same message is sent from Xi to Aj through an artificial delay generator (di + dj – di,j) and then through a transmission line that has latency di,j, thus arriving at Aj at time (t – di) + (di + dj – di,j) + di,j = t + dj. The delay dj is rectified by setting the clock of Aj back by dj. This means that, at UTC time t + dj, all inputs of Aj — including the clock — are identical to those of A at UTC time t. Therefore, Aj makes the same decisions at time t + dj as A would make at time t. Although the decisions made by Aj are made with the delay dj, its outputs are delivered instantly to the server Xj (without the delay dj suffered by outputs of A sent to Xj), which means that both the timestamps affixed by Aj and the message delivery times observed by Xj are identical to the ones produced by the algorithm A. This proves Theorem 1. To get some feel for how the colocated group contraption works, we will use the example from the Nature magazine article. Here, we start with a single “midpoint computer” C located at the geodesic midpoint between two financial center servers X1 and X2 (think of NY and London and imagine trading EUR/USD in the Forex spot market), see the Midpoint computer mechanism figure. Using simpler notations, d = d1,2 (= about 20 milliseconds at the speed of light) and h = d1 = d2 = d/2, and using the general method presented above, we construct a simple functionally equivalent mechanism consisting of a pair of computers colocated with the two exchanges shown on the Colocated pair mechanism figure. t0 An arbitrage opportunity arises: the ask on X1 is lower than the bid on X2. t0+1h Looking at the X1 and X2 prices time stamped t0, A discovers the arb opportunity. A sends a FOK buy to X1 and a FOK sell to X2. t0+2h X1 and X2 servers receive the orders sent by A. The buy sent to X1 succeeds, but the sell sent to X2 fails. Looking at the X1 and X2 prices time stamped t0, A1 discovers the arb opportunity. A1 sends a FOK buy to X1. The buy succeeds. Looking at the X1 and X2 prices time stamped t0, A2 discovers the arb opportunity. A2 sends a FOK sell to X2. The sell fails. t0+3h A receives order status messages from both servers. It decides to liquidate the position by selling to the best bid which happens to be on X2. A sends a market sell to X2. t0+4h The market sell order sent by A is executed by the X2 server. A1 receives order status messages from both servers. It decides to liquidate the position by selling to the best bid which happens to be on X2. A1 does nothing (knowing that A2 will execute the market sell). A2 receives order status messages from both servers. It decides to liquidate the position by selling to the best bid which happens to be on X2. A2 sends a market sell to X2 which is executed by the X2 server. t0+5h A receives the order status message from X2 and updates its trading balance. The balance with the timestamp "t0+5h" is sent to observers on both sides (X1 and X2). t0+6h The balance with the timestamp "t0+5h" is received by observers on both sides (X1 and X2). A1 receives the order status message from X2 and updates its trading balance. The balance with the timestamp "t0+5h" is sent by A1 and received by the observer on the X1 side. A2 receives the order status message from X2 and updates its trading balance. The balance with the timestamp "t0+5h" is sent by A2 and received by the observer on the X2 side. Imagine, in our NY-London colocated pair example from the last section, having to slow down information delivery at a NY data center by a factor of 10,000 (from the typical two microseconds to 20 milliseconds). No self-respecting high-speed trader would accept such design. Removing the delay generators would enable the colocated computers to “see the local future” by comparison with what the central computer sees; this would allow development of a vastly superior trading strategy. A high-frequency trading firm would pay millions of dollars per month to see 20 ms into the future. In other words, if the computer located at the midpoint between financial exchanges represented the best way to cope with the speed of light limitations, then using computers colocated with the exchanges “beats the speed of light” — whence the title of this paper. But even without any additional improvements, the collocated strategies need to be deployed in only N financial centers worldwide, not the N⋅(N-1)/2 “fast trading hotspots” shown in the Nature article. Finally — and best of all — we will never need the scary high-speed trading ships! We have shown that a single central computer mechanism can be always be replaced by a functionally equivalent or better mechanism using a group of computers colocated with the servers. One question that remains is: Can that solution be improved? Could we add a few extra computers in the middle and/or remove some of the colocated computers and get a strictly better solution than any solution that could be implemented using the fully colocated group? The answer is no. The full group of N computers colocated with the N servers provides the optimal configuration which cannot be improved. In order to state this formally we define a new term. An aggregate is a group of computers running a distributed algorithm, including all communication channels between the members of the group and all input and output channels to the outside world (consisting of the “servers”). Unlike for a single computer running an algorithm, an aggregate specification must include details concerning spacial locations of the inputs and outputs as well as the member computers, and latency constraints on communications between these locations. An aggregate is a more formal term for what we called a “black box” in the preceding sections. Given N servers, a fully colocated aggregate is an aggregate of N computers colocated with the respective servers. Finally, to proceed with our proof, we need a computer “join” operation: if C1 and C2 are two single colocated computers running algorithms A1 and A2, respectively, then C1 ^ C2 denotes the computer that runs the same algorithms and uses the combined input/output channels of the two computers as its input/output channels, respectively (see the Computer join operation figure). The join operation is purely cosmetic. The two algorithms run independent of each other on the join computer and retain all of their attributes (such as a clock offset, input delays, etc.). The messages received and sent by two algorithms remain the same as well. The join operation allows us to consider two colocated computers as a single computer that is functionally equivalent to the pair being joined. The operation is commutative and associative. We are now ready to state and prove our main result. Corollary 1. Any aggregate connected to a number of servers can be re-implemented using a fully colocated aggregate in such a way that the new aggregate’s behavior (as observed by the servers) is indistinguishable from the original aggregate. The proof uses mathematical induction on the number K of members of the aggregate that are not colocated with any of the servers. Here is the outline. It is easy to see that the corollary is true for K = 0. Here, each member of the aggregate is colocated with one of the servers. In order to form an equivalent fully colocated aggregate, we add do-nothing aggregate members to servers that have no colocated member, and we replace all aggregate members colocated with a given server with their join to ensure a single aggregate member per server. Assume now that the corollary is true for certain K ≥ 0. Consider an aggregate D* connected to N servers (X1, …, XN) that has K+1 members that are not colocated with any of the servers. We begin by normalizing D*: we add do-nothing aggregate members to servers that have no colocated member of D*, and we replace all aggregate members colocated with a given server with their join to ensure a single aggregate member per server. This does not change the number of non-colocated members of D* or the aggregate’s behavior. From now on, we assume that Di is the single member of D* colocated with the server Xi for i = 1, …, N. and that the members DN+1, …, DN+K+1, are not colocated with any of the servers. Finally, we assume that the member DN+K+1 is not directly connected to any server Xi. If it was connected directly to Xi, we could always task the collocated computer Di to become a pass-through intermediary between Xi and DN+K+1. We now consider all of the D1, …, DN+K computers as the “servers” in Theorem 1. Let C = DN+K+1 be the central computer communicating with the “servers” D1, …, DN+K. By Theorem 1, we can construct a functionally identical system that replaces C with N+K computers Ci colocated with the respective computers Di. Finally, define a new aggregate E* running on computers E1, …, EN+K where we define Ei = Ci ^ Di. It is easy to see that the aggregate E* is equivalent to D* (when observed by the servers Xi), but has only K members that are not collocated with any server. Therefore, by the inductive assumption, E* is equivalent to a fully colocated aggregate. This completes the inductive step and proves the corollary. Note: The proof of the corollary above may be viewed as providing a technique that allows one to eliminate one-by-one any non-colocated members of the aggregate D* without changing the aggregate functionality (as observed by the servers). Corollary 2. The fully collocated aggregate architecture is optimal. In other words, no distributed algorithm can beat all algorithms implemented using a fully collocated aggregate. Note: The corollary above is remarkably general, considering our lenient definition of what “better” means. No matter how you measure the performance of your algo (for example, whether you desire to make or to lose more money), you cannot beat the distributed setup. As an example: Do not run a yen intervention centrally out of Tokyo (or even out of London, for that matter)! So far, we considered Theorem 1 in scenarios consisting of a trading computer connected to many exchange servers, because that scheme fits the midpoint computer scenario in the Nature article. We will now restate Theorem 1 by reversing the roles of exchanges and trading centers. Traditional exchanges have a central matching engine with HFT customers’ computers colocated in the same data center. Remote customers may be distributed throughout the world using computers located in access point data centers (provided either by the exchange itself or by third-party companies) that offer secure, reliable, and consistently low-latency connectivity to the central engine. Corollary 3. Any single central exchange matching engine connected to N ≥ 1 access point data centers can be re-implemented using a group of N interconnected matching engines that are located in the respective data centers in such a way that the new implementation’s behavior (as observed by the data centers) is indistinguishable from the original single matching engine solution. Corollaries 1 and 2 may be restated in a similar manner. In particular, exchange architecture that uses a fully collocated aggregate of matching engines (one matching engine per access point data center) is optimal! Obviously, HFTs figured out long ago the advantages of colocation when arbing AAPL between different NJ exchange servers or when arbing E-Mini on CME in Aurora, IL versus SPY on Arca in Secaucus, NJ. So, why do exchanges persistently use single central matching engines? The main reason is exchange’s performance and profits. By comparison with a single central exchange computer, distributed exchange architecture incurs penalties in terms of design and behavior complexity, increased transaction latency, and additional infrastructure costs. These effects would be experienced and borne by all customers, even those that do not engage in arbitrage and are happy to trade in a single location, colocated with a simple, fast, and relatively inexpensive central matching engine. Distributed exchange architecture would also reduce (or eliminate!) the need for arbitrage and the resulting massive trading volumes that benefit the exchange. Equities exchanges and ATS (alternative trading systems) are required to route orders to other venues to obtain the best price (thanks to 2007 SEC regulation NMS). Smart order routers located at the access points send the order to the exchange where the order has the greatest chance of getting done at the best possible price. Broker/bank internalization engines and dark pools could be considered as extensions of the primary exchange matching machinery. Of course, the devil is in the detail, and when one looks closely, the existing US equities exchange architecture (when considered in its totality as a single mechanism) is horrendously complex and inefficient. HFTs’ computers colocated with multiple proximate exchanges prosper using arbitrage and other clever techniques to exploit the inefficiencies. In the equities futures and options markets, for historical reasons going back to trading futures in corn or wheat, most US stock futures and options trade in Chicago (on CME and CBOE, respectively). Here, it would be logical to simply move the CME and CBOE matching engines to New Jersey. But this is unlikely to happen given that there are (yet) no competitive pressures on the Chicago exchanges to do so. HFTs seem to be happy competing with each other to build better-cheaper-faster distributed arbing strategies (using the Spread Networks tunnel and its true-speed-of-light successors). Finally, let us ask the opposite question: Why and where would one need distributed exchange servers matching orders for a specific instrument in distant locations? One answer is that distributed exchanges would be useful if customers were geographically “distributed” and unwilling to colocate their trading computers with the exchange’s central order matching engine. So far, the only area where distributed exchange architecture found its justification is Forex trading. For example, when you trade USD (US dollar) against JPY (Japanese yen), you need local information about the state of economy of each of the two very distant countries. In addition, there are political reasons against trading one’s currency using a matching engine in a faraway overseas location. Another example of a distributed Forex exchange is Fastmatch, which also has three matching engines in London, NY, and Tokyo. Its architecture differs significantly from that of EBS, however, as orders are not transparently propagated and matched across the three regions. To find more about the wonders of distributed trading systems, study references  and . I thank Michael Merold, Schalk Steyn, Alec Schmidt, Mark Reece, Wlodek Stankiewicz, Ewa Howorka, and others who have provided helpful comments on the initial draft of this paper. Mark Buchanan, Physics in finance: Trading at the speed of light, Nature, Feb 11, 2015. A. D. Wissner-Gross and C. E. Freer, Relativistic statistical arbitrage, Physical Review E 82, Nov 5, 2010. World Federation of Exchanges, WFE 2009 Annual report and statistics, Dec 2009. Stock Trades at the Speed of Light, PhysicsCentral, Nov 11, 2010. Eric Garcia, Physicist says it is possible to use ships to facilitate high-frequency trading, MarketWatch, Feb 19, 2015. M. Rohan, Dark pool and HFT: It is possible to use ships for high-frequency trading, International Business Times, Feb 19, 2015. Timothy B. Murray, HFT’s Oceanic Moment, WatersTechnology, Mar 11, 2015. M. Rohan, Dark pool and HFT: BoE says high-speed trading helps markets, International Business Times, Feb 24, 2015. Scott Patterson, High-Speed Stock Traders Turn to Laser Beams, Wall Street Journal, Feb 11, 2014. Michael Togher, Michael F. Dunne, Richard Hartheimer, Credit management for electronic brokerage system, U.S. Patent No. 5,375,055, issued Dec 20, 1994, assigned to EBS. Edward R. Howorka, Andrew P. Foray, Architecture for anonymous trading system, U.S. Patent No. 7,184,982, issued Feb 27, 2007, assigned to EBS. Edward R. Howorka, Method and apparatus for enhancing market data feed using proprietary order flow, U.S. Patent No. 8,296,217, issued Oct 23, 2012, assigned to MarketFactory. Edward Howorka, In brief, colocation beats the speed of light, The Trading Mesh, Apr 9, 2015. Here is the PDF version of this paper (you need Adobe Reader or a similar tool to view or to download it). I believe you mean to say the “sell” sent to X2. Good catch, Trent. I corrected the post. Many thanks for attentive reading. This post shows step-by-step how to improve a centralized algorithm, thanks for taking time to sketch it out.